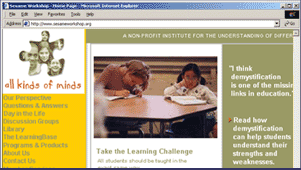 All Kinds of Minds, a not-for-profit institute for the understanding of differences in learning, wanted to increase the visibility of its programs and products. The Gass Company was invited to become a member of its “brain trust,” a small team of learning and media professionals who served as creative and strategic advisors to the institute. The Gass Company assumed major responsibility for the design and production of the institute’s web site as well as its branding strategy.